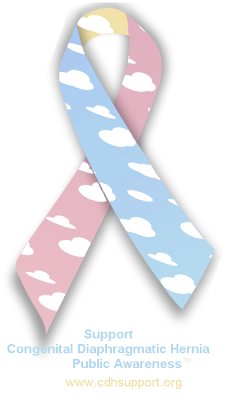 These can be donated to the hospital in honor or in memory of their cherubs. When new cherubs arrive, they visit with the new families and keep an eye on them; making sure they have all the information and support that they need. If you would like to adopt a hospital, please let us know! You can e-mail me at dawn.williamson@cherubs-cdh.org and make sure to give me your name, contact info and let us know which hospital(s) you would like to adopt! Once upon a time, CHERUBS used to be able to afford to send out new member packets and items for new and expectant parents. We haven’t been able to afford to do so for the past few years unfortunately due to lack of donations and a membership that has grown wildly. But our New England members have started offering this service again to new and expectant members up north and we are thrilled and proud of what they are doing and hope to offer it across the U.S. again soon! 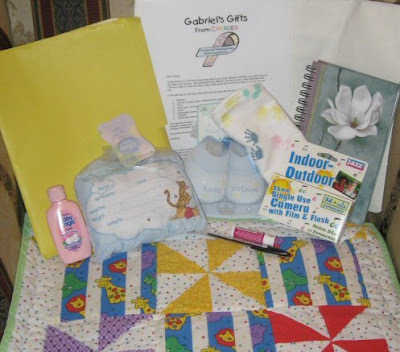 Gabriel’s Gifts is a project we started to provide new and expectant parents of CDH babies with gift bags. We all know how difficult it is to have a child with CDH living in the NICU fighting for life, and hope that these bags will bring a little comfort to those families. In these bags we hope to include items such as a baby blanket/quilt, eye cover, hat, booties, journal, pens, disposable camera, childrens book, lip balm, CDH information packet, gift cards, and any other comfort items that may be helpful. We are in desperate need of donations to put these bags together. For $20 you can sponsor a gift bag that will help a family in need. In exchange for your sponsorship we will include your cherubs story in the sponsored bag. We also would greatly appreciate in-kind donations of any of the above items. If you would like to donate some items or would like to sponsor a gift bag in honor/memory of your cherub please contact Corin at cnava@cherubs-cdh.org.